A few of the projects I work with use static websites based on middleman, which you can run locally to see how your edits, or those of others, will look on the live site when they’re merged. Each of these sites defaults to port 4567 when running locally, so if I’m running more than one of them at a time, they complain that their favored port is already taken. It’s easy enough to fire up middleman on a different port, but I thought I’d try and run a couple of these in containers, using a local instance of OpenShift Origin, a Kubernetes-based container application platform. 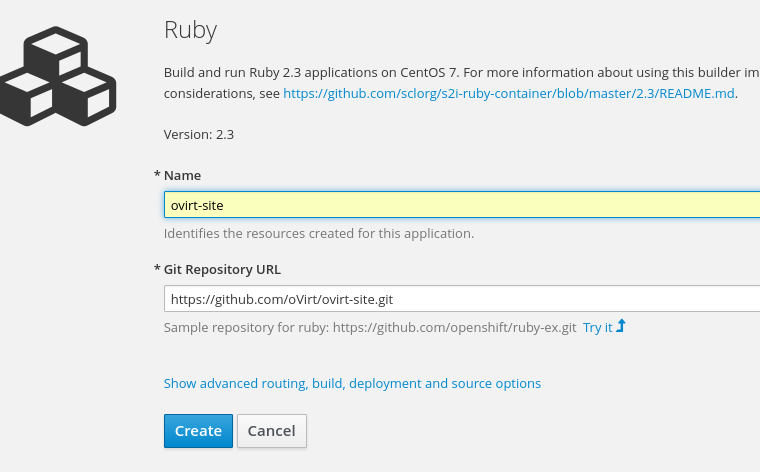 It’s pretty easy to get up and running with an OpenShift Origin instance using the command oc cluster up. The oc client is available for Linux, Windows and Mac OS. Since containers (pretty much) are Linux, you’ll need a Linux VM on Mac or Windows, but the oc client can use docker machine to take care of that for you. I haven’t tested that, though, because I use Linux already. On Fedora, I followed these instructions, with the exception of installing the oc client from the Fedora repos (dnf install -y origin-clients), rather than downloading the binary from GitHub. $ sudo cp -r /root/.kube ~/. 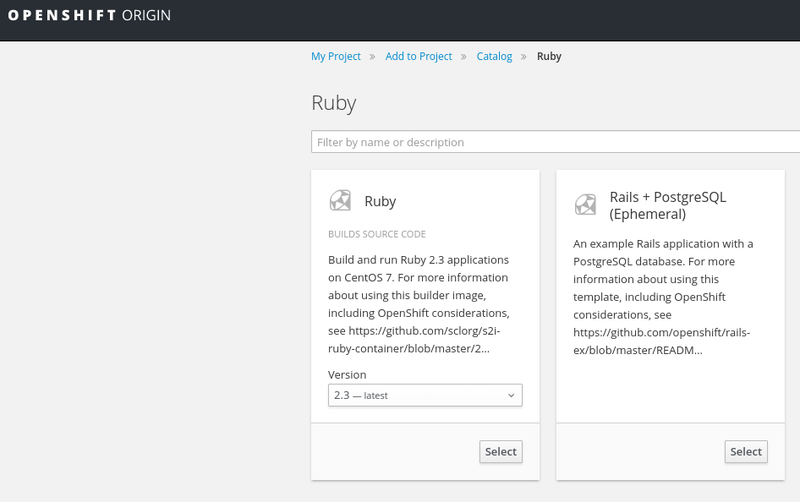 I logged into the OpenShift web console using the URL and the developer:developer user name and password output by the oc cluster up command, clicked “Add to Project”, and then, under the “Languages” heading, chose “Ruby,” and then “Ruby 2.3”, because middleman is a ruby affair. I headed to the “Overview” page, saw that my build was running, clicked “View Log,” and saw that a familiar-looking build process was chugging along. 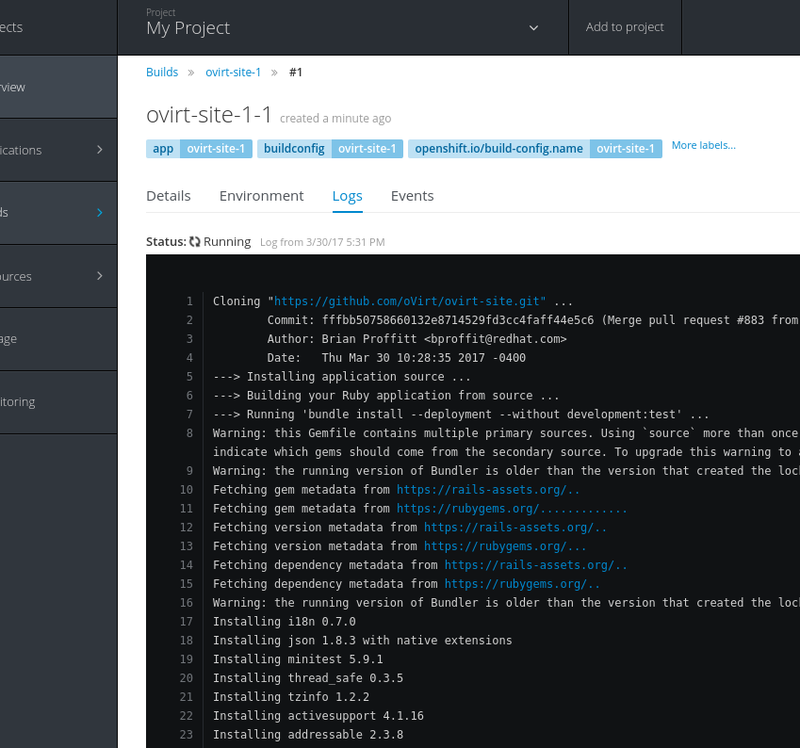 When the build finished, OpenShift kicked off a deployment of my image, which I could see from the deployment log linked from the overview page, was erroring out. After some poking around, I fixed the issue by heading to the deployments section of the web console and, after first pausing the deployment, hitting the edit YAML button. I used the YAML editor to add a command right in between the image and ports sections of the configuration. I also changed the containerPort from a default of 8080 to the middleman default of 4567. I expected this change to filter down to the service and route that were automatically created for me, but they didn’t — it wasn’t tough to edit those via the web console, however. I added GIT_COMMITTER_NAME and GIT_COMMITTER_EMAIL environment variables to my deployment, from an “Environment” tab in the deployments area of the console. As I eventually learned, git got grumpy about running as a random UID (as is OpenShift’s security-conscious custom) rather than as a “real” user with an entry in /etc/passwd, but adding those ENV variables calmed git down. Once I had a pod up and running, I was able to view the development site in my web browser via the URL provided in the routes section of the console. I think that that approach would then work for a regular kube cluster or, with some tweaking, probably, docker or docker swarm as well. This entry was posted in post and tagged docker, fedora, kubernetes, middleman, openshift origin on March 30, 2017 by Jason Brooks. 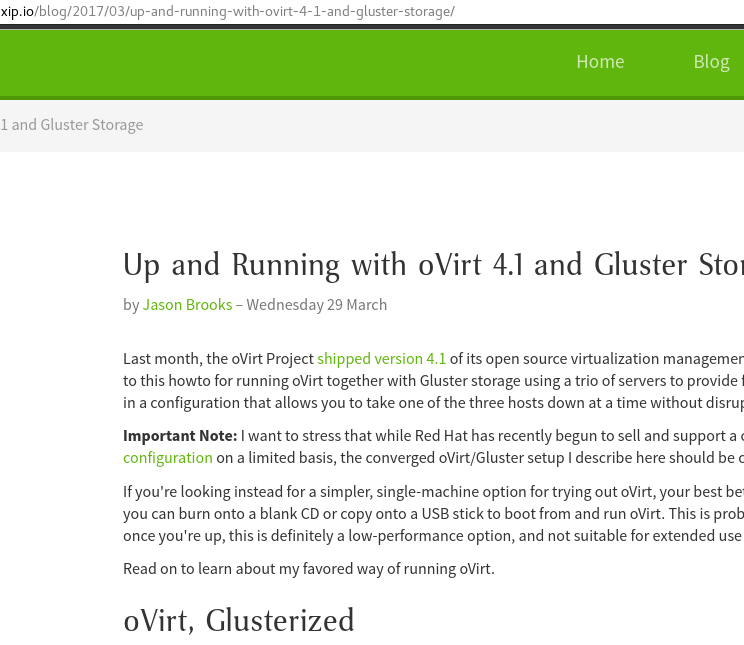 So, I’m working my way through the OpenShift Origin BYO PaaS wiki page, but I’m stuck right now near the finish line. On Saturday, I was cranking through the howto, highlighting and middle-click pasting my way to BYOP nirvana, until I hit an authentication issue when it was time to create a domain on my newly-minted PaaS. 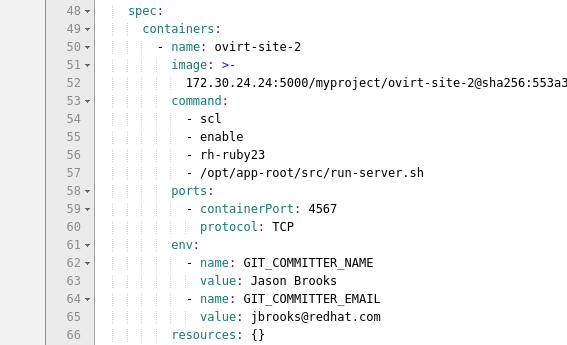 After taking a break for a couple days, I realized that I’d simply forgotten to point my rhc client at the right host — rhc defaults to openshift.redhat.com, and if there’s an account on the Red Hat hosted server with the user name “admin” I can confirm that that user’s password is not “admin” as well. Cinch. I’d be up and running in no time. Except I hit another issue — my host complained about: “Permission denied – /var/www/stickshift/broker/Gemfile.lock” and there was no such file on my host. With I bit of help from #openshift-dev, I got past the error by running “bundle install” in the broker directory and then chown-ing Gemfile.lock apache:apache. But I hit another error message: “Failed to authenticate user ‘stickshift’ on db ‘stickshift_broker_dev’.” Word in #openshift-dev is that this is a mongo issue that someone else following the BYO instructions recently encountered as well. Another weekend, another shot at the BYOP. I restored my host back to a “fresh install” snapshot, followed all the directions, and am stuck again at the end of the directions. Getting the error: /usr/lib/ruby/gems/1.8/gems/uplift-bind-plugin-0.8.3/lib/uplift-bind-plugin/uplift/bind_plugin.rb:8: uninitialized constant StickShift::DnsService (NameError).